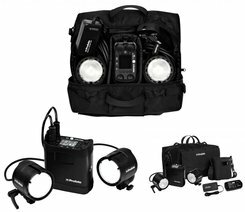 The B2 Location Kit contains everything you need to overcome almost any lighting challenge you might face on location. The kit includes a B2 battery pack and two B2 flash heads. Connect one head and keep moving. Or connect both heads and explore the B2's full potential. There are two batteries and a battery charger. Use one battery while charging the other and keep shooting indefinitely! Also included is a handy carrying bag, allowing you put the B2 on your belt, shoulder or stand.